As an artist, sometimes I see something and it inspires some sort of creative moment, whether it is an intricate detail or pattern or the play of light and shadows over an object. Found objects, such as this boxfish cast are so interesting I just have to turn them into an intricate study of their structure. The scientific aspects of the structures come to light later as the relevance of why these structures are the way they are becomes apparent and ties into how they impact the life of the being they came from. This particular cast structure could not be identified as a particular species of boxfish, but given the location it was found, it is more than likely a Scrawled boxfish according to Dave Graff at the Rookery Bay National Estuarine Research Reserve. 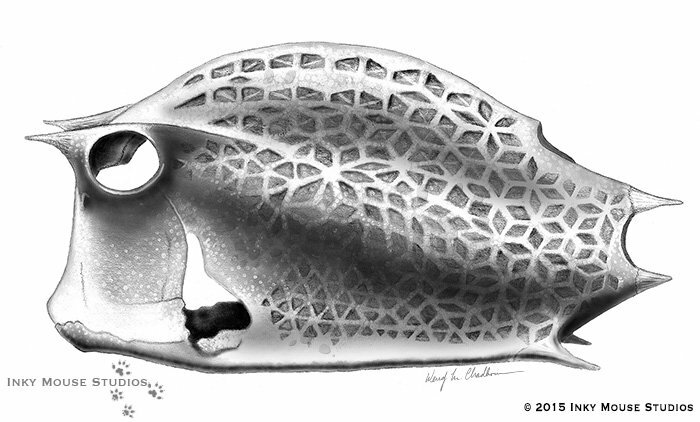 While the cast could not be narrowed down to a specific species, I decided to include this interesting structure in a carbondust scientific illustration of a Honeycomb boxfish which had a more definitive body coloration pattern for a greyscale illustration than the Scrawled boxfish. 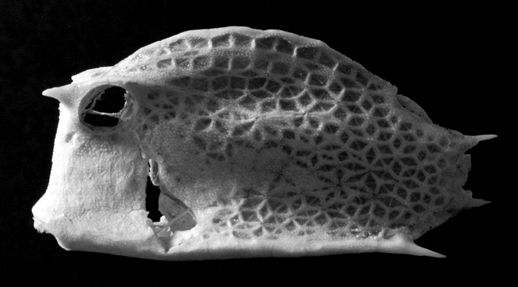 This is a black and white photo I took of the cast structure of a boxfish in the Acanthostracion genus, which was found while beach combing at Tigertail Beach on Marco Island on the Gulf Coast of Florida. After finding it the scientific mind took over. I embarked on a fact finding mission to figure out what kind of fish it was, what it’s normal range is, behavior, and feeding habits. This search led into an interesting discovery about the locomotion of boxfish, and how their seemingly cumbersome, inflexible bodies are shaped in a manner to help them control their movements in the turbulent waters around the reefs they inhabit. 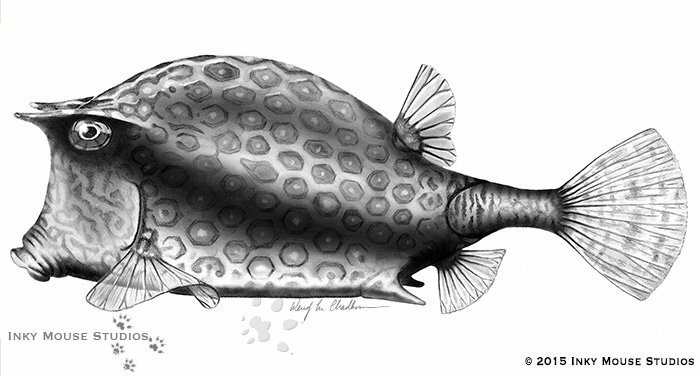 Those keels and curves to the body all play a key role in stabilizing the boxfish as it swims.